Disclosure: I received this product for free as part of a review for GoWallet. The opinions in my review are honest and my own. Now that Halloween is over, I am prepping myself for the holiday season. I have to admit, I'm not looking forward to grocery shopping later today and hearing Christmas carols. Don't get me wrong, I love Christmas shopping, just not seeing Christmas everywhere before Thanksgiving starts. That being said, with so many stores already posting awesome deals leading up to Black Friday, I am planning on starting my Christmas shopping this weekend. I have been gathering up all of my gift cards from throughout the year and trying to find some awesome deals. The problem, however, is I've already lost hours trying to find places the right places to read my gift card balances. With all the partially used gift cards I have, I feel frustrated that there is no easy way to keep up with all of my cards. I was about to give up until I found out about a new smartphone app. – GoWallet. Wanting to learn more, I reached out to the company, who was excited to have me review their application and even gave me a $25 Applebee's Gift Card to prove that the app really was worth my time. As someone who loves technical solutions to my little difficulties, I was ready for the challenge! Wish you had something that let you keep up with all of your gift cards and would check balances for you every time you used them? If so, we think you will love GoWallet. This innovative new smartphone app allows you to store all of your gift cards in one easy to use application. Putting gift cards in their system is super easy! All you do is put in the button, the pin, and then watch as it pings the system to give you your current balance on that card. When you open the app, it even shows you all your current gift cards and their balances, allowing you to spend your money wisely during the holiday season. As well, GoWallet allows you to see exclusive store offers, and purchase gift cards that you can use yourself or send to friend and friends as an emergency gift. For proper security, you can also set a pin, making sure people don't use your gift cards if your phone is ever stolen. Another cool feature is that they even provide the contact numbers in case your card is lost or stolen while you are out. In other words, GoWallet is a must have tool for anyone who uses or gives gift cards! I have to admit, I was surprised how easy GoWallet was to use. The hardest part was typing in all of my card numbers on my iPhone. Once I had all the information in my phone, it automatically started looking for balances. All of my gift cards pulled up balances, except for two – American Express and Barnes and Noble. Now, my Barnes and Noble gift card is over three years old, so I wasn't really too upset about that one. The American Express, I guess was more of security feature, but it did give me a number where I could quickly call into American Express's system to get that balance. Either way, most of it worked as designed, allowing me to have all of my gift cards in one easy to find place. Now, to completely test the system, I was given a $25 Applebee's gift card. After all the nasty storms and a hard day of work, my husband took me out to eat, where we used this gift card. Since margaritas were on sale for Halloween, we got one of those to share, as well as their 2 for $20 deal. With drinks, our bill ended up coming to a little over $30. Immediately, I pulled up my app and gave them the gift card, wanting to see what would happen when the server used it. As I was pulling up the system, I was reminded that I had money on my American Express gift card – score! I hadn't even planned on using that gift card and GoWallet reminded me it existed! After the server collected our gift cards and extra money, I watched the app, seeing as the Applebee's gift card corrected itself, now showing a zero balance. So, because of GoWallet reminding me of the second card, we were able to have dinner for two, with drinks, for under $10, including tip! So far, I have to say I love GoWallet. It is so nice having one place where I can keep track of all of my gift cards. When I first heard of this app, I thought it would be just another app on my phone that would quickly be forgotten. Now, after using it and seeing how it saved me money, I think it's a must for everyone who has gift cards aroudn. While some stores do seem to have issues automatically updating the gift card amount, I think this will be quickly fixed in time. Based on my own experience, I am happy to give GoWallet an A rating! Want to know the best part of GoWallet? It is totally free! You can download the GoWallet app in the Google Play store or through the Apple App. Store. If you don't have a smartphone, don't worry, you can also register for their service for free online. With the holidays being right around the corner, who doesn't need GoWallet?To get started, make sure to go register at GoWallet. Disclosure: Budget Earth did receive compensation for this review and also receive a $25 Applebees Gift Card for review purposes. All opinions on this product are my own and may differ from our readers' opinions. Would you like to have your products featured in a similar giveaway event? Want to increase your social media exposure before the holiday season? See how we can help! Contact susan.l.bewley@gmail.com to see what we can do for your company! It is so amazing to me just how far technology has come. GoWallet seems like a great App for those who have a Smartphone! I like having the balance at my finger tips, no more calling that 800 #. I also like having them all in one place, no more forgetting about a card. Okay, that's a seriously cool app! I'll have to check that out for the holidays because there's always the inevitable gift cards for Christmas. Not that I'm complaining, of course, but this will definitely help! Thanks for giving me all the details! This is a great app! When I get a smartphone I will have to own this app! I was going to comment on my lack of having a smart phone, but was really pleasantly surprised to see that they have an online service as well. Does this work for itunes cards as well? Thanks so much for this review…..all the information I could possibly need, and answers to questions I hadn't thought of…what a great idea!! Thanks for sharing something I had never heard of before…wonderful! What a great, clear review. This would be a great app to have and it sounds easy. Thanks! This GoWallet is cool, I don't have a Smartphone, makes me want to get me a Smartphone. I gotta catch up with the times. Sounds like a great system to have. I love using gift cards for holiday shopping, but find it a pain to keep track of them. Gowallet is really a wonderful idea. Helps me keep track better and organized too. What an awesome idea! I once misplaced a very large ($1,300) gift card and was very sick for several months until I was able to get it replaced (thank goodness). If I'd had the info on GoWallet I would have been much better off. Thanks for the reco. I love gowallet. It helps me keep track of my balances. It's interesting to see how useful your phone can be. I'm sure lots of people will use this. Love GoWallet. GoWallet allows you to see exclusive store offers, and purchase gift cards that you can use yourself. I used a card and when I got home it was on my accound. easy. I have heard awesome things about Go Wallet. This review has really opened my eyes even more about this company. Thanks for filling in the unanswered questions I had about it. You really detail your reviews and that's always good for us fans. Thanks for another awesome review and I will be looking out for more!! Go Wallet sounds really helpful and convenient! I always have to call the 1-800 number on the back of giftcards to find out what my balance is, this way would be much better. If you are someone with a lot of gift cards, I can see how Go Wallet would be a huge benefit. There's an app for everything! That sounds pretty good. I don't have a smart phone though. Just a wall phone. I get lots of gift cards to use and I give lots of gift cards as gifts, especially for hard to shop for friends and family members. I like how easy GoWallet seems to use, and I like that it reminds you of balances remaining on gift cards. I often have no idea how much is left on any particular card. Thanks for the review. Thanks for your review of the app Go Wallet. I had forgotten about it. I had it on my iPhone and it had so many helpful uses. However, my son lost my iPhone and I had forgotten about all the apps I had on there. I remember adding all of the information into Go Wallet and that it took a while, but it was worth it to have the information handy. My whole life was in my phone. Maybe my son will find it in his room. What a mess! I really need to use the Go Wallet app to put in my gift cards and know what the balance is so I have it handy and ready when I need it. I think that this is such a good way for me to use my gift cards, and this keeps me from losing them! I think it's wonderful that the Go Wallet is available! It's so very hard to keep up with all the balances on the gift cards and this is a great way to help keep everything together and accounted for! Thanks for sharing this. I would love to try this. Great review!!! This is such an awesome invention. What a super way of keeping gift cards organized and all in one place. This would even make an awesome gift for Christmas itself. I might find this beneficial if I received gift cards. However I'm not fortunate enough to be blessed by this generous gesture. I never had a interest in having a Smsrt Phone, but after seeing how they really do make life easier with different apps I have changed my mind. what a great app. So convient for shopping. GoWallet is such a great idea! Right now, all of my gift cards are in an envelope and it's so hard to know how much I have on any of them! I like that this would let me keep them in 1 place and track all of that for me! Thanks for sharing this with us! Wow I thought that this was an App for Smart Phones, since I don't have one I had given up on this for now, but now that I know that you can use it without, I have alot of Gift Cards, I will certainly hook up with it. Thanks very much for the info and for letting me know about it being for everyone! I love the fact you can instantly scroll through and get your balance. Saves time and hassel of calling the and trying to read the numbers on the card. I also love you have the number store in case it's lost or stolen. I really need this. I have lots of gift cards and I seem to be calling the 800 numbers to find out the amount left on them. This will make my life a lot easier. This is awesome. Definitely something I would use. I love the concept (after all, I have so many cards from various businesses it's hard to keep track of them). I am a bit surprised that several of my favorite restaurants aren't represented, so hopefully they'll be adding more (Olive Garden, Red Lobster, Panera). I just updated my phone to an iPhone 4, so I would really love to add this app. Anyone want to give me some gift cards? LOL! Really amazing app!!!! Could really use this since on christmas i usualy receive a lot of giftcard and sometimes after time i even forget I got them. Thanks for the great tip, love it!! The GoWallet app sounds like a great feature to have if you have a smartphone. Unfortunately, I do not have one. However, I am going to share this with my daughter who has a smartphone to see if she has one so that she may download this feature, especialy since it is free. Now, I'm going to search the internet to see if there is a free feature like this for me to use on our desktop or laptop. Thank you for sharing this great info with facebook and on your blog. This is absolutely great. It is just what I need to keep track of my gift cards. There are times when I completely forget about them. Wow! I can't believe all the capabilities of GoWallet. with all this information at our fingertips, I can;t imagine needing anything else. Right down to how to call if we lose our phones. Technology-just can't beat it with anythinh else. This is a great app. I currently use gift cards quite a bit and this would be so much easier than calling all those 800 numbers for the balances before wanting to use them. I will be installing this immediately. Great Giveaway!! Thanks for the helpful information.. Will have to give app a try.. I love the GoWallet concept of keeping track of your gift card balances. As soon as I'm done, I am going to the Apple store and downloading this. Thank you for your review. It was not only helpful, but motivating. This is great! I went and joined and added all my odds & ends of cards to it. Don't have a smart phone so wasn't sure if it would work on my ipad mini, but it does. Thanks. I love that it keeps track of giftcards, however, I rarely have giftcards, so I'm not sure if I need it. This looks great. I would definitely be intersted in trying them out. This sounds like a really cool ap. I have so many cards in my wallet, between insurance cards for me and my family, library cards, Savings Cards, gift cards, etc. It would be nice to just be able to download them instead. That way I wouldn't have to dig for them when I need them. Sorry. I misunderstood some of it. That's what happens when you read at 2 am. lol. My favorite part of this ap is that if you lose your card, Go Wallet has you covered. It is like insurance for your gift cards. Twchnology is wonderful the new gadgets as of now are great this would be a great place to shop. This is a great idea, I signed up today. I have been a little leary of GoWallet and any other apps of the like, only for fear that someone could hack into it and get my cards. I do have 3 gift cards, one for $50 and the other 2 have balances of $5 and under. Maybe I will download the app and add the 2 low balance cards just to test it out. Im still owrried especially with the holidays of someone hacking into it and getting all the card numbers. I wonder how do they ensure this does not happen? I'll have to read more into it. Thank you for the review. Thanks for all that you do! It is greatly appreciated! Now this sounds really great! I'm always wondering how much I have left on my gift cards. I'm going to get this on my iphone! Thanks! What a cool app! Thanks for the interesting review! Thanks for the info, as I hadn't heard of Go Wallet previously. I will definitely try it out and see how it works for me. I like convenience and this seems to be. GoWallet will really help me keep track of all my gift cards which is a wonderful thing to use! That is a great app!I don't have very many gift cards,but if I had a lot I can see where this app would be very uesful.Thanks for a great review. Maybe I missed it, but can you redeem cards straight from the app? My wallet would be so much slimmer if I weren't carrying around like 15 gift cards. It 's a cool app. in deed&I want to handle with such a new excllent tecnology so intrroduced byGoWalled in phone arena.Thanks for such a fine reviews. I have Go Wallet and it is very easy to use. The only I wished I could do was actually view my purchase not just my balances. GoWallet sounds great. I often find cards with no balance(why do I have them? )or am missing cards. both my husband and i both have & use this app often, def worth the download!! How great would it be to not have to keep all the receipts or do all the math when using your gift cards? This would be so great to have, especially with Christmas right around the corner. This might be a great download! My son already uses GoWallet, so I have already heard of it! He loves it! I dont have a Smartphone, but the way he talks about it, and after reading this review, it makes me want to get one. He has only good to say about this App.. It keeps track of all of them, and makes it so much easier on him! I sent him the link to your review, so he could read it, himself! Makes me wish I had a smartphone so I could have this app. Downloading this right this minute! Looks like a valuable app to have, thanks for sharing! This seems like the perfect app for someone that uses a lot of gift cards. Hubby and I usually buy giftcards at the beginning of the year and put money on them as we have it available. Then we use these for Toys for Tots in November/December when the sales start hitting. GoWallet would help easily keep track of the balances. This is great I too always have lots of gift cards but never remeber how much is left on them. This is a great way to keep up with it. I love the features of this app! I feel that it's definently safer and more convienient than keeping a stash on money on you. You really spent a lot of time doing that review! I've won gift cards before and and it is a pain to keep track of everything you spend on paper! This looks like a much eaiser way to do that stuff. This would be great, as I hate having to always call the number on the back of gift cards to check the balance. Will definitely get this app when I get my new phone this week! What a fabulous app…I am so going to give it a try…I love my smart phone and all the things I can do with it. Yes, if you have a lot of gift cards and have a hard time keeping up with balances this would be very helpful. Thanks GoWallet for this great service! I think that Gowallet is a great app for those that get multiple gift cards throughout the year and it sounds as if it actually works to keep accurate track of the balances on those cards. For me it wouldn’t do much good but I think the amazing thing about it is the technology behind it. If we can figure out how to make things like this we can pretty well figure out other ways to solve other aggravations. Cool! Thanka a lot for useful information.l shall try to have this awesome new techonologysoon. This information is very helpfull! It is nice that you introduce us to new technology! Looks so easy and like a great way to keep track of all your gift cards! I always seem to lose GC somehow, it is quite annoying! This is a great app, even better that's it's free! I'm downloading it to my android phone now. I love gift cards! I think I could own millions of them lol better than having cash in my opinion. Thats pretty nifty! I have a few that have such small balances I dont know what to do with them. This would make it so I didnt lose money! I had not heard of it before this review – and I am constantly checking all my card balances by calling, so I am definitely going to try this out! Thank you for the great review, and I can't wait to see if it works for me! This deff makes life easier. Having so many giftcards and keeping up to date on their balances can be so confusing. I usually end up throwing them out after a while of not knowing or not feeling like calling the 800 number. I think I may give this a try after reading all of the great reviews on this app. It sure would beat having to call to check the balances all the time or keep up with reciepts. This would definitely make things easier to keep updated on my giftcard balances. This way you don't have to call the 800 number and go through the many prompts just to get your balance. I've never heard of this before but I am definitely excited about it! I like the concept of keeping up-to-date with my gift cards with the GoWallet program. I find the variety of gift cards to be interesting. I have signed up to check it out! Thank you for the review. I really enjoyed reading this. The smartphone app for GoWallet could be especially helpful while holiday shopping, especially during the Christmas Rush, and on Black Friday. There would be no need to guess if you have enough money to make a purchase. This would also be especially useful for the after Christmas sales shopping. Before reading this post, I never heard of go wallet. I like the feature that it keeps track of gift cards and balances. Since I don't have a smart phone, I went online and found out Go wallet has a online service. I will signing up for this. Finally a convienent, easy way to keep up with all those gift cards. Kudos to the genius that came up with this new, inventive idea. 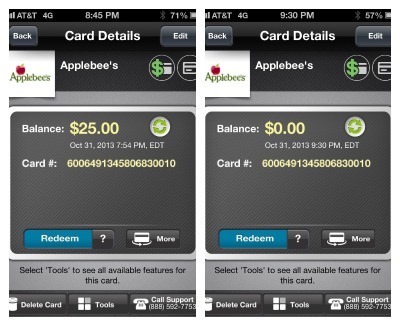 The GoWallet app sounds awesome…..even more of a reason for me to get an i phone! I hope to be getting one soon, I am so unorganized , the Go Wallet would be perfect and helpful for me, thanks! It's nice to have one place to go to see how much is on a gift card. Thanks for letting me know about this site. I'm putting it in my favorites. I never heart of this app before, but I think the idea of it is really interesting. Even though I don't get as many gift cards, it's nice that the app is there in case you have one. Gift cards are kind of small and easy to lose, and with the app you could immediately put all the information in there, so that even if you would lose the card, you would still be able to use it! Great invention! My first thought was, "I don't need this if I'm doing a cash-only budget." BUT, then I noticed it's for keeping track of GIFT CARD balances. THAT I can use! When I don't want to carry a lot of cash I will get a gift card for the store I plan to shop at, plus it's the time of year for gift cards. Thanks! I may just look into this a little more. This sounds like an amazing useful app. I always have gift cards in my wallet that I am unsure if they have any balance. A bit embarrassing when there is no balance, oops should have thrown that away. This is a very inventive idea, but I like having the luxury of a physical gift card in my hands. Just like I am with actual books instead of kindles. That's just my opinion! I could truly benefit from this app! I get really annoyed when I have to call to check my balance esp. with a very active 6 month old I just don't have time for that. This app really sounds like a time saver! Also I love that it gives you the stores latest deals and discounts so you know whats on sale! I had no idea something like this existed! Now that I have a smartphone, I will sure be using this app! Seems to be a very inventive idea. I have always had trouble keeping track of gift card balances, will be checking in to this. This looks like a great ap. It sure would be nice to be able to place all your cards into one place. Love it! Im always re checking my balances on all my gift cards, having to call, look up on my old laptop to see what they are, i have won a couple of ecards (small ones) and know that a few have ""cents"" left over lol, but how much i couldnt tell you! this is a great idea! now if i only had the right phone to have this! Great app! I can finally keep up with my gift cards! I don't have smartphone so I wouldn't be able to use this app while I was out shopping, but if I did have a smartphone, I'd definitely install it! It sounds like a great way to keep track of all those gift card balances. That is a supercool app (am I right in saying that?) I don't have a smart phone, I was hoping to win one this year, but so far no luck. Oh well, saving money on the monthly charges. Wow, how handy! I had no idea this even existed. I love to be organized so I could see where I would like this. Thanks for the review! This is quite a innovation. I would be able to put this to good use, being able to keep tabs on the balances of my cards. It would save so much time while shopping. Thanks for informing us about this great free app. This is a really great concept. I always waste so much time looking up the balance on my gift cards so this would be great to have on hand while shopping! 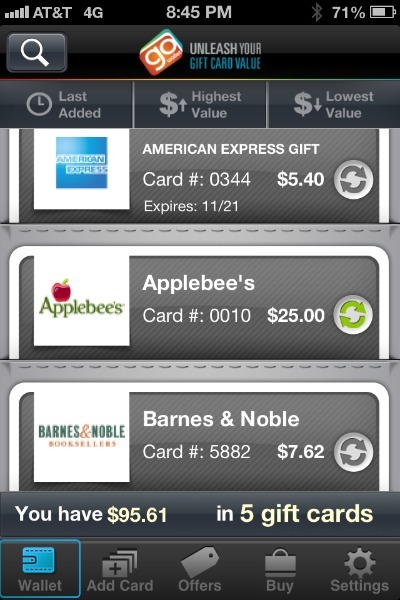 What a cool app.GiftCards on the go! I like anything that makes the process of shopping simpler. This is really neat especially if you have a lot of gift cards to keep track of. I've long shied away from giving "Gift Cards" for gifts because they just seemed to "insecure," hard to keep track of and just kind of generally confusing an impractical. People would end up with a bunch of expired or partically used cards. I love that you can easily check your balance and report a lost or stolen card. This is a very cool and long overdue/awaited APP – only down side is needing to have a Smartphone! This is a really convenient idea. You wouldn't have to worry about losing or leaving your cards behind. Or the other hand, I don't have a smart phone so all these apps don't work for me. Very cool app! I'm downloading it now…I can never keep track of what gift cards I have and how much is left on them . I wish I got that many gift cards to be able to use this app.But I do not but for someone that does it would be a great idea.Thanks for the review and if I ever get that many giftcards I will use this app. Thanks for sharing, I didn't know about this company. This is a great concept, you don't how many times I've had to search to find out my balance on gift cards. This would surely put an end to that. Love it. Informative! However, I do not have a lot of gift cards lying around. I use all of my gift cards pronto. I have the old fear stabbed in me back when gift cards expired. So, being thoughtless is no longer a gift. But its a cool app if you get a ton of gift cards at Christmas. This is awesome! I need a smartphone so I can get this app. I've had cards expire with balances because I couldn't keep track of the balance. What a wonderful idea! This is really a great app. For someone who has a lots of gift cards from various places. Great way to keep track of the balances and keep in check. This is a wonderful app for people who give and receive lots of gift cards. I love this! Such a great idea to have all my cards in one location! If I had a cell phone with that capability this would be defineately one thing I would want on it. great app. To bad its not for my computer. But great way to keep track of balances to. i love this idea …. keeping track of all giftcards in one spot i think someone should have thought of this sooner …. GoWallet app is sold to me now! Thank you so much for the review, very helpful. I now need this app on my phone asap. Amazing! Great ap, wishing for a smart phone for Christmas. Hoping for lots of gift cards, too. This is such a fantastic app! Wish I had thought of it! Right now I don't have a smart phone, but when I get one, this will definitely be one of the first apps I download! I'm going to let my brother know about it, for sure! What a good, typical and bad credit score range to get is freescore com.